Lost for over 10 years, the National Standard of the Air Gunner Association has been discovered in East Sussex and was presented this week to the National Air Gunners Collection and Memorial here at the Allied Air Forces Memorial. The Air Gunners Collection here at the Museum has restored examples of original gun turrets from Allied aircraft and shows the fearful and cramped conditions these brave airmen endured. Over 45,000 air gunners flew highly hazardous missions with the Royal Air Force and suffered the highest casualty rates of any single unit in WW2. Over 22,000 were killed in action and overall casualty rates were almost 60%. Rear gunners especially were often the first target of attacking enemy fighters and the young airmen suffered terribly especially as rear turrets were a lonely place away from the rest of the aircraft crew during missions. The Air Gunners Association was set up after the war with many thousands of members and paraded at most memorial events for almost 70 years. Their National Memorial began construction in 1992 by wartime veterans themselves, in special memory of all their close colleagues who were killed in action. Donations were received from air gunners, their families and friends from right across the world and the location they chose for the memorial was the Yorkshire Air Museum, now officially recognised as “The Allied Air Forces Memorial in Europe”. 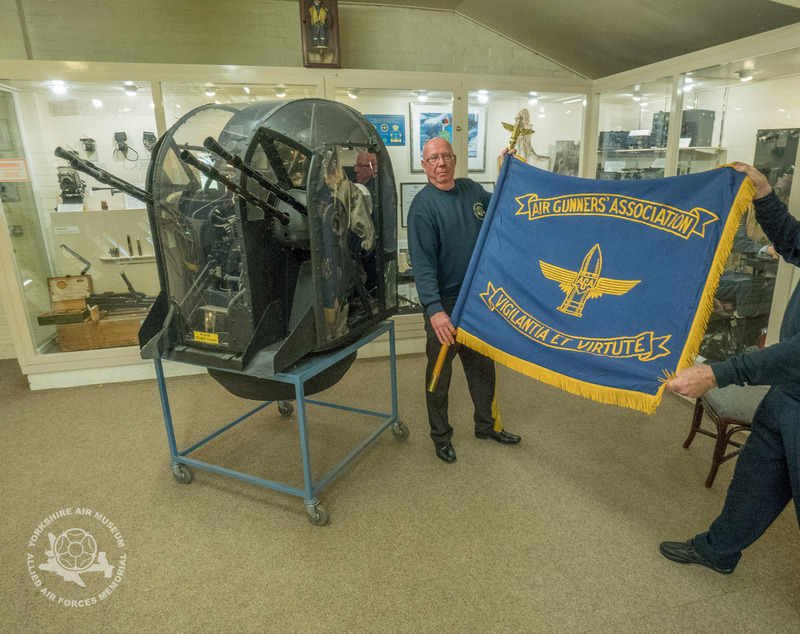 The Air Gunners Association was the forerunner of the Aircrew Association, also representing over 25,000 air force men and women worldwide. The AGA National Standard became lost in around 2003 when Association branches began to disband as their members became older. Searches over several years revealed no clue as to where it was located. Museum / Memorial Director Ian Reed today, “We recently received a letter out of the blue, telling us that the Standard had been discovered, “somewhere in the South of England”. It sounded like a typical wartime censored story, but the flag has now arrived and is resplendent amongst the unique turrets and artefacts in the Memorial”. Air Commodore Graham Pitchfork MBE, Chief Archivist of the Air Crew Association Archive Trust said, “It is wonderful that the AGA National Standard is at last within the National Air Gunners Memorial at Elvington. Many thousands of veterans and their families across UK will be delighted to see this significant object representing those who gave their lives, it in its rightful place at last”. I am writing book about the life story of Thomas Arthur Lockett GM, a mid upper gunner in 630 Squadron stationed at East Kirkby from 1944. Can l please have permission to use the picture of the gunners standard in my book. Thomas Arthur Lockett will be 97 years old on September 23rd,and lives here in Broadstairs Kent.